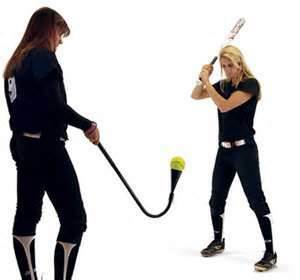 There are Good, Bad and just plain Dumb Hitting Aids on the market today and I take exception to, in my opinion, companies whose intent it is to rip off little league coaches, players and parents, who are trying to offer their players the best training available. I’m going to reveal, what I consider rip offs, and explain why. I’ll call this first aid the “Stationary Catapult” because it reminds me of medieval times when armies would hurl rocks against the castle walls attempting to break through. The use of the bench, I assume, is for the comfort of the server, pitcher, I’m not sure what you’d call him, so we’ll simply say operator. I don’t mean to offend anyone, but unless the operator is handicapped and can not stand, the use of a bench on a baseball diamond is dumb. 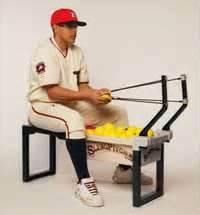 How do you level a bench on a pitching mound? Pulling the slingshot back would be more strenuous than standing and controlling the speed and location of the baseball would be all but impossible, because the slightest angle of the bands would result in propelling balls into the dirt or shooting them over the backstop. I’ll call this aid the “Standing Catapult” and the only thing better than the stationary one is it gets the operator up off their tush, but we’re not suppose to be training the server, but rather the hitter. They have replaced the bench, which would be difficult to transport and level once on the field, to sinking 2 poles into the ground. These poles must be placed deep into the ground in order to prevent them from angling downward after a few pulls of the bands, which would create an upward angle sailing the balls into the stands or across the street, and I’m not so sure I’d like to be around when the grounds keeper catches you digging up his infield to sink metal poles into the pitching mound. (2.) Dropping the ball straight down. 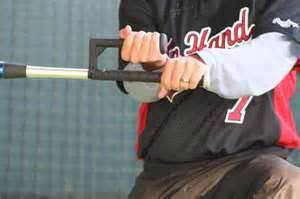 The intent of any such hitting drill should be timing and eye to bat to ball coordination. Tossing the ball upward to the batter allows the hitter to track the ball and at it’s zenith, when it pauses, strike the ball. This dropping the ball doesn’t help any hitting skill except timing a dropping baseball, which you’ll never encounter. I understand the concept of teaching the wrist to roll over, but this devise appears to be extremely awkward and uncomfortable to use, and if a devise is cumbersome to use, believe me kids will not use it unless forced, which results in a half effort. 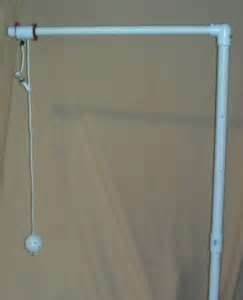 This devise is used to propel fly balls to outfielders, which is the only thing it may perform half way right. (1.) The platform must be secured to the ground in some manner or else it would fall backwards as the bands are pulled. (2.) 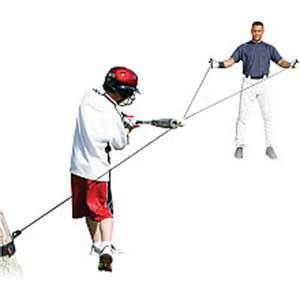 If the back extensions and the weight of the operator are designed to prevent the devise from falling over backwards, that can not alone prevent the front from raising, which throws slinging controlled fly balls out the window. (3.) Outfielders need to read the ball as it comes off the bat and although modern composite bats make that difficult in comparison to wooden bats, they still need to hear the different toned ping and see the batter’s swing. This devise does none of that. This devise is designed to offer the ball to the batter at any desired height or plate position, but for lack of better terminology, is dumb. (4.) 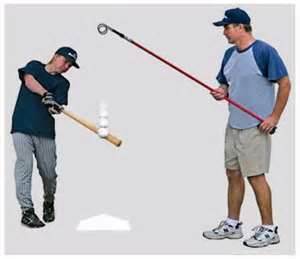 What bad effects could happen to the operator if the batter hits the devise instead of the ball? This type of devise has been around in one form or the other for years, and although they change the design, the results are still the same. 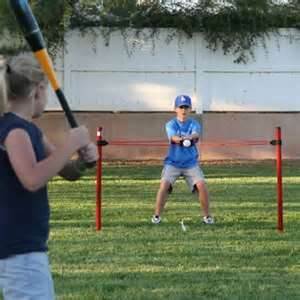 Don’t get me wrong, this type of hitting aid has it’s very limited benefit, such as a beginner player practicing their swing and unlike hitting off a tee, never having to go get the ball. However, for older players this is a waste of time. Why? 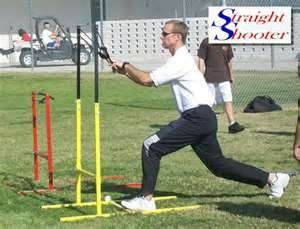 Because BP is all about getting in as many swings as possible and this devise does not fulfill that requirement. After hitting the ball, unless you physically grab the ball and stop it from swinging, you’ll waste a lot of time waiting for the ball to stop, instead of taking swings. I believe I’ve saved the best for last because this is without a doubt the dumbest contraption I’ve ever encounter trying to pass itself off for a hitting aid. I don’t care who endorses it, the devise is silly and won’t work. Period. 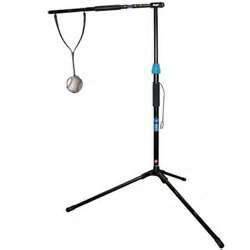 There is absolutely no hitting skill what’s-so-ever addressed by this devise. (4.) Usually when a baseball is coming at your front side, you’re trying to get out of the way, not hit the ball. If anyone would care to dispute my opinion on any of these so called “Hitting Aids” I’d like to hear from you and I promise I’ll listen and if proven wrong, I guarantee I’ll post a retraction on the piece of equipment.